I was goofing around with some yarn the other day, and came up with what I thought was a kind of neat, yet simple, hexagon motif. Being such a big geek, I immediately thought of Settlers of Catan. I'd already made 2 Catan blankets, so I thought I'd do something new! Starting at the corner (see the pic), slst, sc, sc, hdc, hdc, then dc in every stitch thereafter. At the valley between two motifs, I did at 3dctog. For the handle that isn't directly attached I used the chainless foundation technique to continue with the dc stitches until it was as long as I wanted, then joined up on the other side, reversing the pattern of stitches at the beginning. Turn, and do the same stitch pattern, though working dc's into the chainless-foundation-dc's from before. Turn, slst, then sc in every stitch, slst the last. cut the yarn, weave in ends. I really like this, thanks for the pattern! This is beautiful. I'm going to make one! I LOVE this! Thank you so much for sharing your pattern! 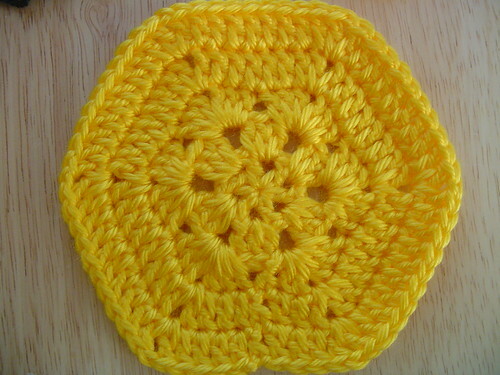 I may have to break out the crochet hooks this weekend! I really like the pattern, and cute bag! Well, I had to Google Settlers of Catan, but now I know what you mean! 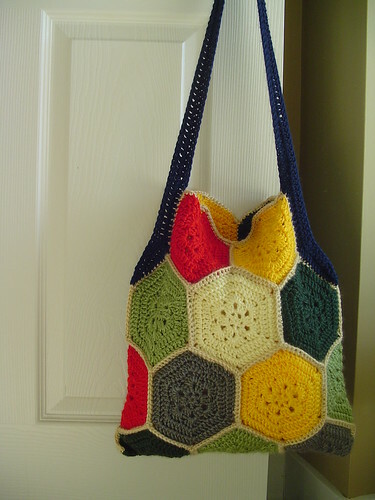 This is a lovely bag and is going on my wists! Love the bag and thank you so much for the pattern!